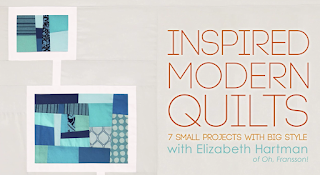 I am excited to bring you my review of Inspired Modern Quilts by Elizabeth Hartman on Craftsy for Sew Sweetness. 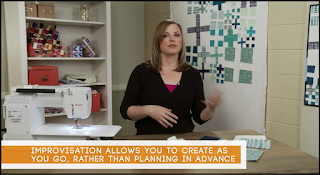 Please check out her blog for a review every weekday of Craftsy classes to choose from to expand your learning! 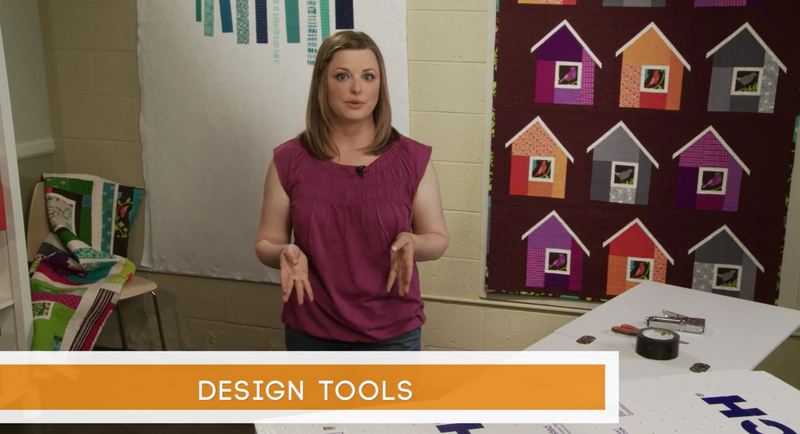 This class is comprised of 7 small projects designed for the person who has knowledge of basic quilting skills. However, the Craftsy platform is designed to ask the instructor questions and you own the course forever so you have access any time at your own pace. There is also a projects page so you can share your projects with everyone else enrolled. There is access to a download of your course materials. Lesson# 1 Is an introduction to the course and all about Elizabeth’s background and quilting accomplishments. She also discusses the reasons she considers herself a ‘modern quilter’. She has a very pleasing voice and explains instructions in a clear and concise manner. One thing I love about the Craftsy platform is the ability to take ‘notes’ electronically as you’re watching a lessons that will remain in the lesson for reference! Lesson# 2 is creating two simple design tools you can use in your quilting, a Design Board and a Pressing Board. These are fantastic tools that I don't think everyone realizes how helpful they are. I didn't have any idea about them for years and I can't imagine getting by quilting successfully without them now! 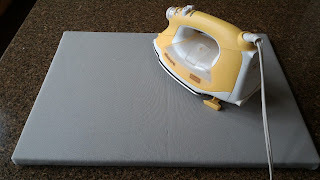 I already had made both but discovered that it was best to cover my pressing board with Canvas fabric rather than quilting cotton (I had scorched it before), so I took some grey canvas from my stash and re-covered my board and I like it so much better! Lesson # 3 is Selecting Fabrics. 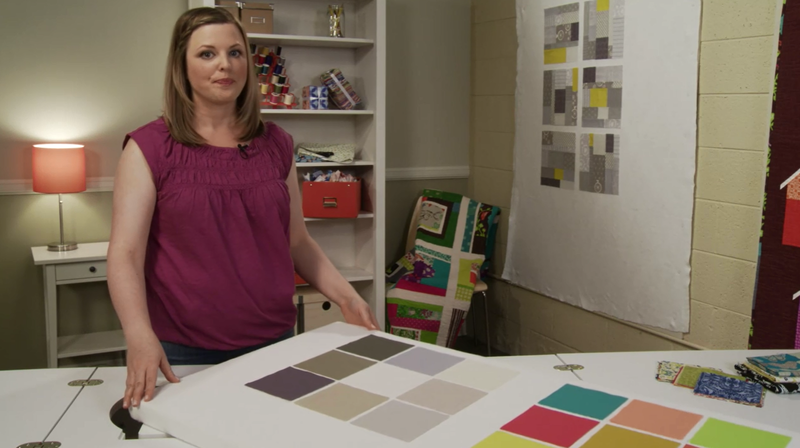 She reviewed elements of solid and print fabrics with tips about complementing your print fabrics with solids to prevent a mish-mash of prints in your design. Lessons #4 - #10 are modern patterns where Elizabeth walks you through the whole process from beginning to end. 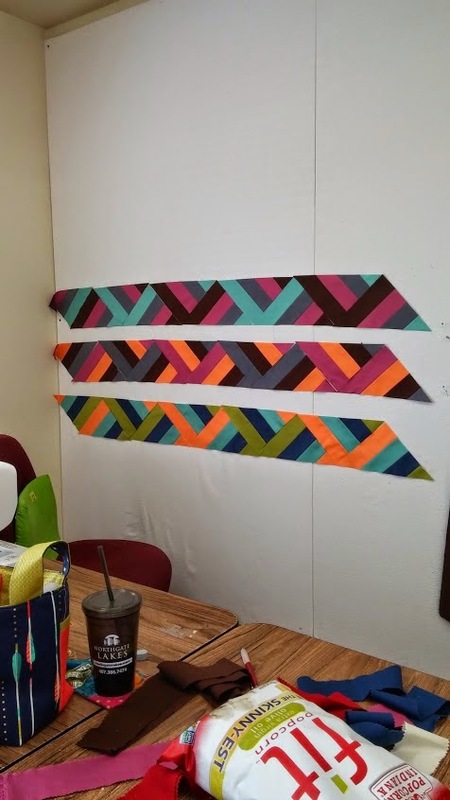 She displays her sample quilt on the wall for reference and starts with suggestions for fabric selections, progressing to cutting, pressing instructions and finishing with placement on the design board and finally assembly. 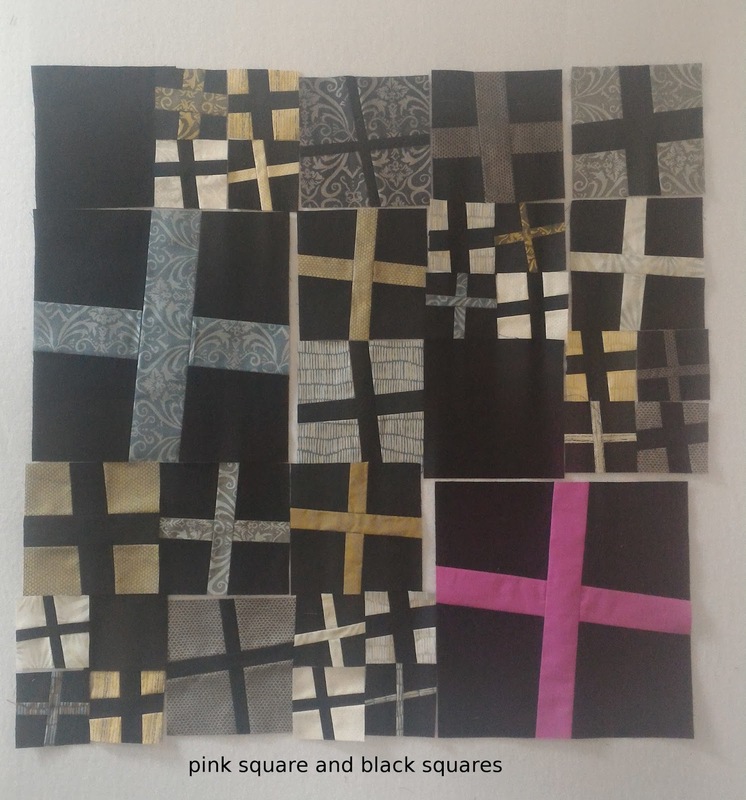 I chose to make the Modern Crosses quilt pattern. The improvisation appealed to me (and is also the best pattern to create a new quilt for my middle sister as a Christmas gift!). 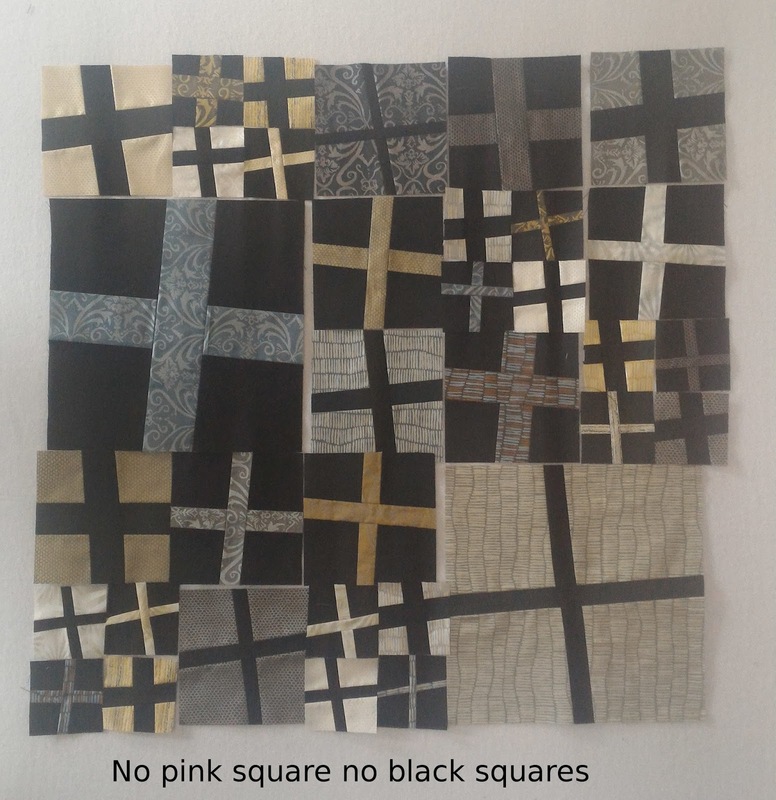 Improvisation can be defined in different ways for quilters; above is Elizabeth’s definition. I like that you are actively involved in the process as you work instead of planning everything in advance. It’s quite fun and freeing, but doesn’t appeal to everyone! I was able to cut my squares in a few hours and started assembling my squares the same afternoon and was having fun with it from the beginning! Now her quilt is a wall (or small baby) quilt so I am making mine 4 times as large to make a lap quilt. In the course materials, Elizabeth gives dimensions and fabric requirements for her smaller version as well as the lap size version. That in itself adds value to the class in my opinion! Here are pictures of some of the blocks I made; 3 versions that I was able to play around with on my design board. 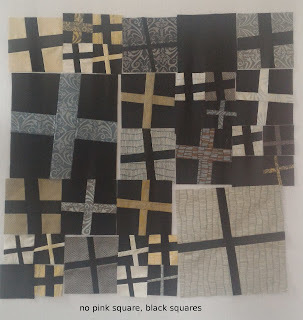 One aspect of modern quilting is the use of negative space, something the modern crosses design lacks. So I decided to keep some of my solid black squares without the cross bars to audition them with the design and I am so happy I did! Here is what the original design would look like as Elizabeth's instructions. I like it but think it is a tad bit too busy for me. Here is the addition of black squares to rest the eyes. I like it much better. This is the design I am going with. My sister's favorite colors are pink, purple and black so I am adding a total of 3 Kona Gumdrop crosses in the design. This was at the suggestion of a friend of mine who I value her opionion. She said it would give it visual interest and I agree wholeheartedly and love it!! This is a big benefit of the design board! You can step back and see if anything is askew more readily than placing your squares on the floor which I used to do. In conclusion, I thoroughly enjoyed the class and look forward to making some of the other patterns in her class. Needless to say, I highly recommend Inspired Modern Quilts class if the modern quilting aesthetic appeals to you. 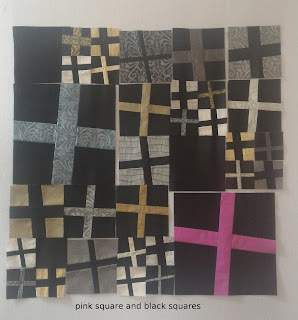 I love that although I’ve been quilting for nearly 5 years (link to my first quilt here), there were still a few tips and tricks I learned in this class! Additionally, I know a lot of Sara’s readers are bag makers. 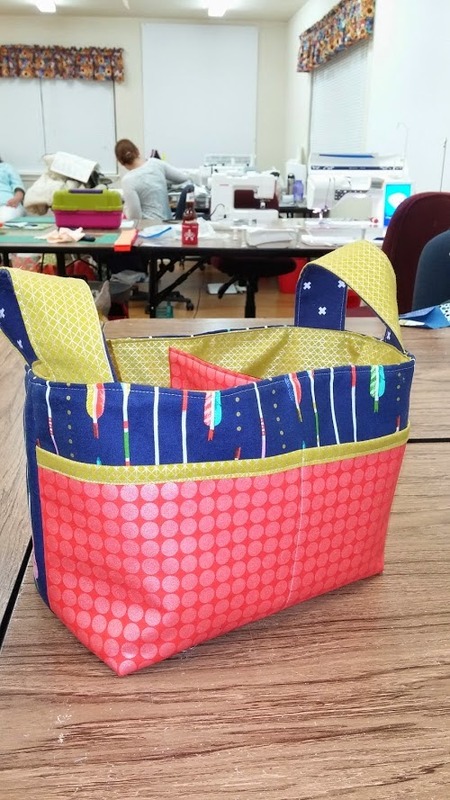 I too started out making bags (a few years longer than quilting), but when I felt it was time to broaden my sewing skills, I took an online quilting class to learn and I never regret it. 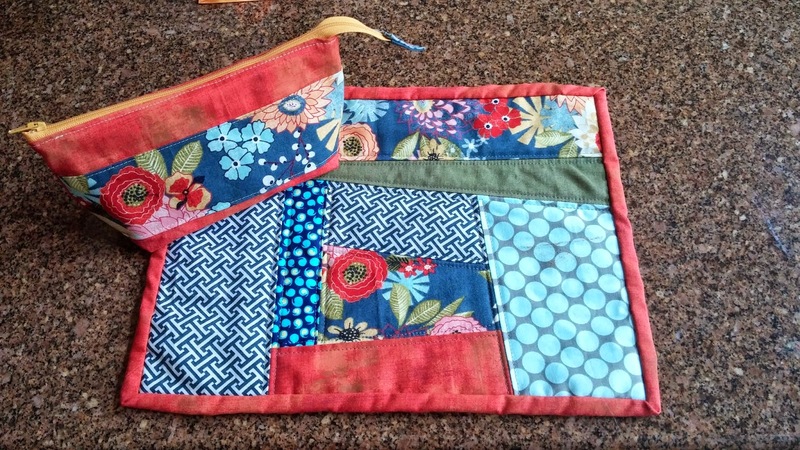 Making quilts to enjoy and give has been very gratifying to me! 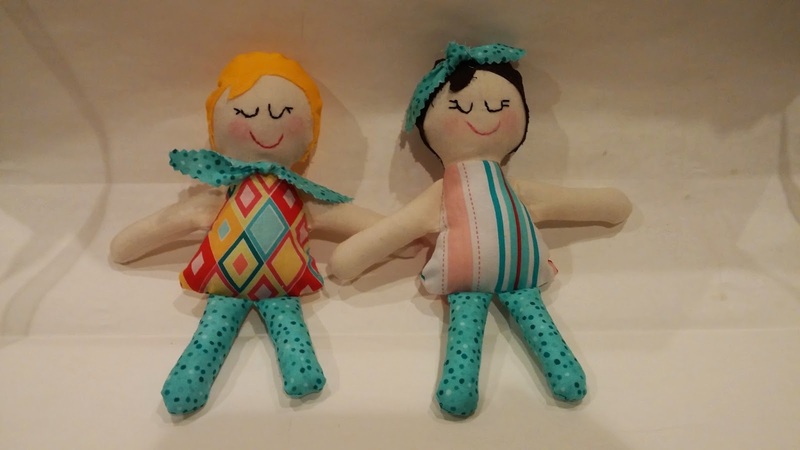 Here are some sweet Josephine dolls I made for some friend's daughters and entered in the Spectacular Softies contest at Sew Mama Sew! 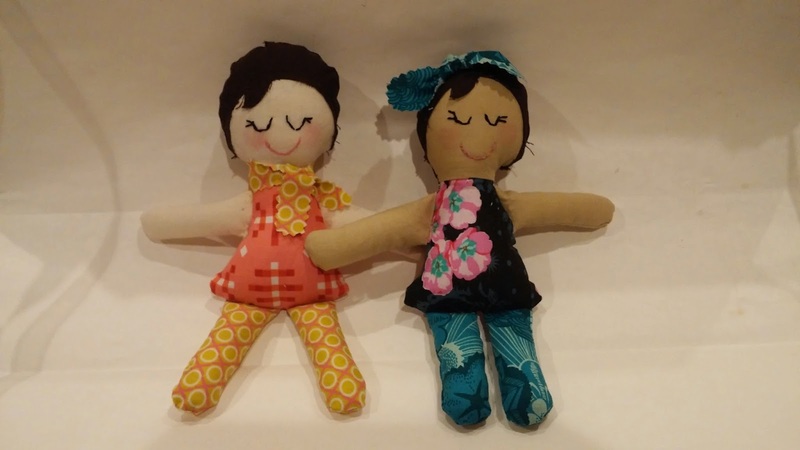 the pattern is free here by Abby Glassenberg and it is a great fun one! One of my coworkers sent me pics of her giving the doll to her little girl (15 months old) and I have to tell you, it was priceless! I should have asked her permission to share but thought it would have been weird to even ask. Just take my word for it, seeing the expression on her face of pure joy and hugging on the little doll made the hours I spent making it WORTH it! A Super Tote for me!! I finally made a Super Tote (by Noodle-head) for me! This was the 5th one I made and I have to admit I have not tired of making this pattern, and it's true that practice makes perfect because this one came out the BEST of all of them. I also made it in record time (I believe it was less than 7 hours where the first took over 10!) I was so excited also to cross something off my 'to make' list because I purchased this fabric well over a year ago), check! The main fabric was bought at my LQS The Cotton Cupboard, it's called Katharine's Wheel by FreeSpirit. 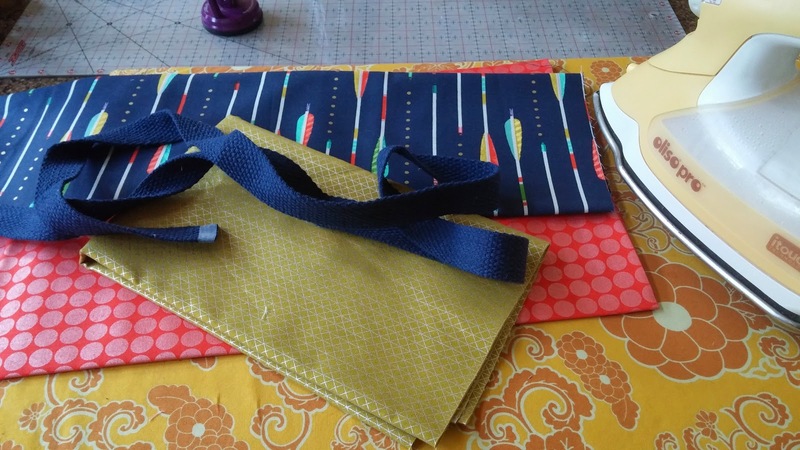 I also found the lining and orange fabric at the same store but already forgot what they were. The red gusset fabric was purchased at Hancock fabrics. 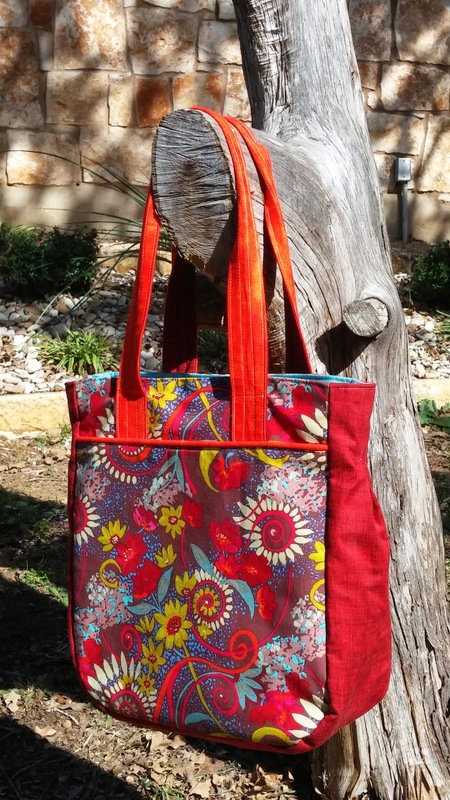 I truly love this tote! Here is a dark peek of the inside (sorry! ), I chose to make the gathered pocket just on one side and on the other I put a simple divided pocket for my cell phone, pen and sunglasses. I like having a variety of different pockets inside my bags/purses. 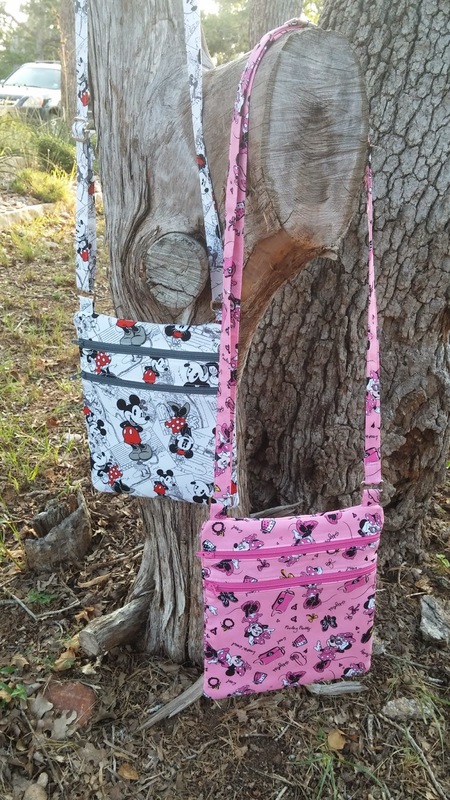 I'm excited to be guest posting over at Sew Sweetness today as part of her 3rd Annual Purse Palooza series. A whole month of bag pattern reviews with giveaways every day (which are sadly coming to a close). Go check out my review of the Jet Pack pattern by Betz White and be sure to enter today's giveaway. Sew along with us and be sure to link up your creation(s) by November 14th for a chance to win to even more awesome prizes!! 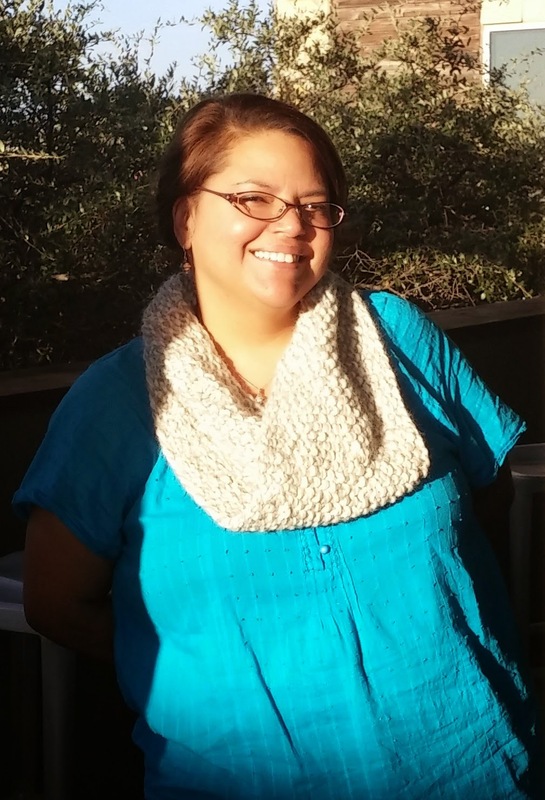 New knitted cowl, celebrity sighting and Purse Palooza kicks off!! 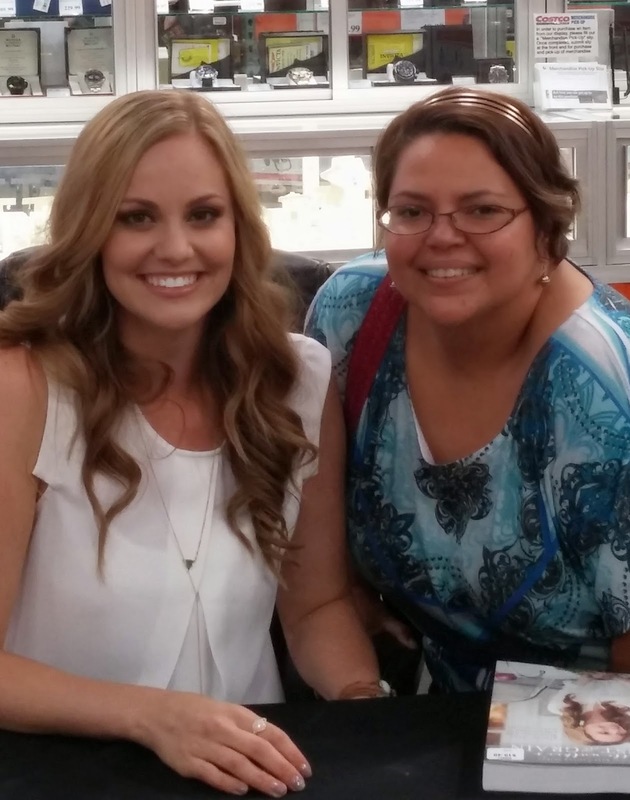 Last night I was able to meet Danielle Walker of Against All Grain at Costco. Her story is remarkable, you can read it here. Basically she was diagnosed with an autoimmune disease, changed her eating lifestyle to exclude dairy, grain and legumes and healed herself. She is just gorgeous and sweet and her husband is as well, he was with her at the signing. I have enjoyed making lots of recipes from her blog and first book, Against All Grain. Just over the last year & a half I have changed my eating habits to a broad spectrum of vegetarian, vegan, paleo and lost about 20+ lbs and have kept it off, eliminating constant diarrhea (sorry too much information) I had suffered with for years (which a doctor had no idea what was the cause without putting together a food diary). I have also noticed a remarkable difference in the condition of my nails which use to peel and all of a sudden do not. I have not changed anything else but my eating lifestyle (and do not take vitamins) but I admit I still do occasionally indulge in full sugar sweets but on a rare occasion. I actually enjoy the healthier alternatives found in Danielle's recipes and on Chocolate Covered Katie's website. I also try to exercise more, get at least 7-8 hours of sleep and have energy to do what I want for the most part. Working overtime at work during the months doesn't help me stay on a healthy regime but I still try. can't wait to try recipes from this cookbook now! 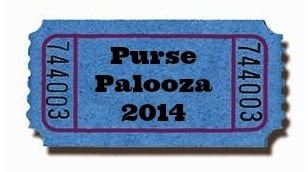 Lastly, the 3rd Annual Purse Palooza kicked off this week at Sew Sweetness! It goes all month long with reviews of 2 bags/purses a day and daily giveaways you can try winning! I am so honored and excited that Sara asked me to participate with a review and it will be on the last day October 29. So I hope you will come back to see what my review of The Jet Pack pattern by Betz White! 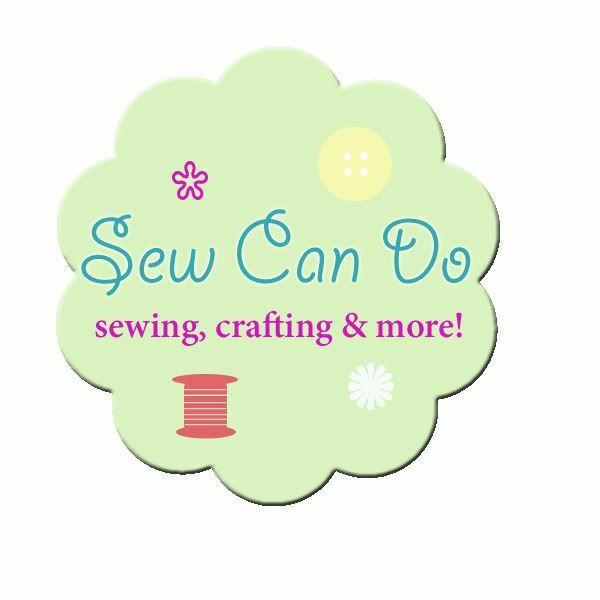 Be sure to check out the post, get on Sew Sweetness email subscription so you don't miss one post - best of all, you have until November 14 to enter a bag YOU make during this time to be eligible for some awesome prizes! Hope you have fun with it - I know I do EVERY year and look forward to it! Here is a pic of the insides. Just Kona cotton solids which matched perfectly. and since I had some leftover fabric, I made a lil' cutie pouch by Noodlehead for my niece. I didn't end up having time or a matching zip to make my sister one, but maybe some day since I still have fabric leftover from her bag. If you've never tried one of the patterns by Erin from Dog Under My Desk or Anna from Noodle-head, you are missing out. They are accurate, detailed and very well priced patterns! thanks for stopping by and please leave a comment so I can visit your blog back! I love knowing if someone is reading! Here is my finish for the #dividedbasketsewalong I participated in a few weeks ago. This was the first finish of the Austin Modern Quilt Guild weekend in Wimberely TX. It was a great time with some pretty neat ladies. The quilt ranch was just beautiful! Sorry about the big background around the basket that is a little distracting, but I took the picture at the retreat. I almost wasn't able to finish it because I forgot to bring the gold binding for the pocket - gasp! But one of the gals, Andrea came to my rescue because she bought her recently purchased Cotton+Steel with her (even though she wasn't planning on using it!) so she let me cut my strip - I was SO grateful!! These are some of the rows I assembled on Sat, which is the next quilt for a Christmas gift. I actually put together all 9 rows in about 12 or so hours! I loved having a large design wall at my disposal right behind me and I sure put it to use! I used a Kona cotton jelly roll called Merlot I got from The Fat Quarter Shop. I am very excited about putting this quilt together and even more excited about gifting it! The design is 'ribbons'. I am not sure if I've shared my love for Instagram enough so I have to tell you one night after work, I stumbled upon 2 new sewers to follow Shequiltsalot and good_starter and discovered they are doing a Noodlehead pattern sewalong for the Divided Basket (the pattern is only $6.50- great value). This is a pattern I have been eyeing since she released it. I have a lot of Anna's patterns, they are well written and easy to follow with great features. I am excited to use this as a sewing tool basket to keep next to my sewing machine. Right now I use a plastic mini laundry basket from Dollar Tree. it's cute, but finding something inside always take a long time since everything is just thrown in. With the divided basket, there's two inside compartments and outside pocket - much more practical. This weekend 10 local fabric shops were having a shop hop in Austin - and although I didn't have any plans to participate, I ended up convincing bribing my husband to come along with me and I will buy us lunch. Works nearly every time. Our first stop was Bunnysdesigns where I know the shop owner. 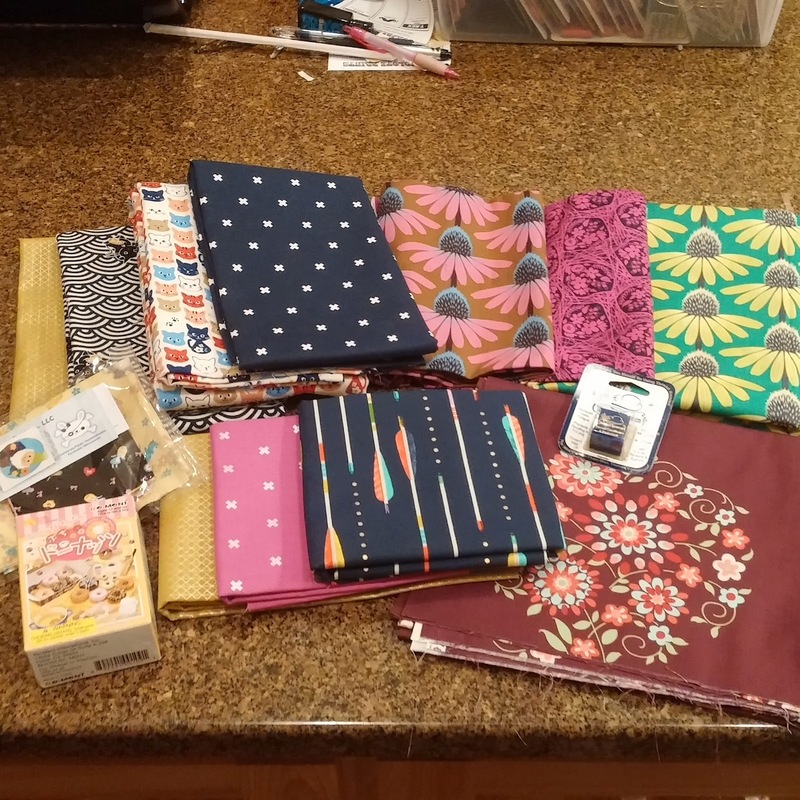 That was a fun place, I had intentions on getting some Cotton+Steel fabrics because she got a shipment the day before, but little did I know I would fall in love with several of her Japanese cat fabrics! Well of course - since I love cats!! 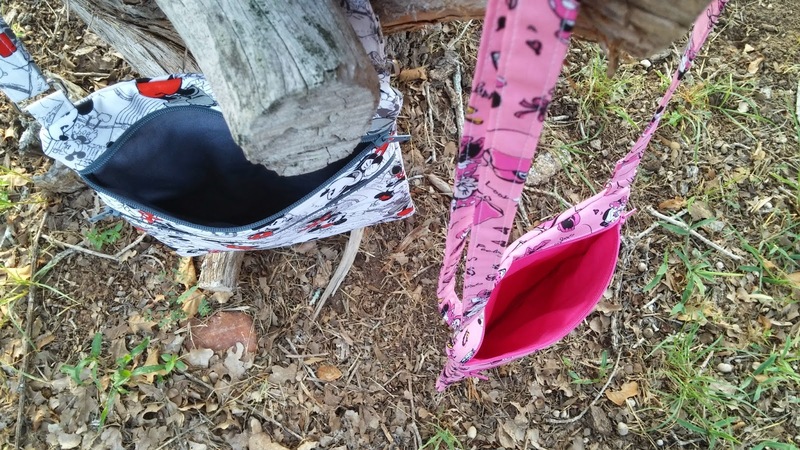 I found the cutest cats to make my Road Trip club Duffle Bag (that I can really use for my upcoming quilt retreat with the Austin Modern Quilt Guild ladies) so as soon as I finish this blog post, I am getting cracking on that!! Here is a pic of all my loot - our next stop was Stitch Lab, that place has such charm. This is where I finally was able to get some long coveted Anna Maria Horner Pretty Potent. Then, we had a delicious lunch at Bouldin Street Cafe which was a recommendation by my cool tattoo artist. It was vegan/vegetarian and we look forward to going back there! Our last stop was in Buda B&B Quilting, which was not on the shop hop but I saw one of the gals who is a guild member (that sat next to me at the last meeting), so it was fun chatting with here there. I finally got some beeswax for thread conditioning when hand sewing that I've wanted for a while. Then I got the lower right fabric an old line from Amy Butler's Love collection for only $5.00 a yard! I'm not sure I will go back to that store though, it doesn't carry my style of fabrics. It was a super fun unexpected day thanks to my awesome husband!!! It would be fun if you participate in the #dividedbasketsewalong with us! Thanks for stopping by! Today I have to share with you another improv mug rug I made for my sister for her birthday. The fabrics are Basic Grey and Amy Butler. I figured she could use it at her desk at work to brighten up her space. We all need that for those of us who work in cubicles, right? I also made an extra small open wide pouch (tutorial by Anna of Noodlehead). I had the fabric already cut out from a purse I made and gave to my sister last year, otherwise I would have made the pouch bigger. 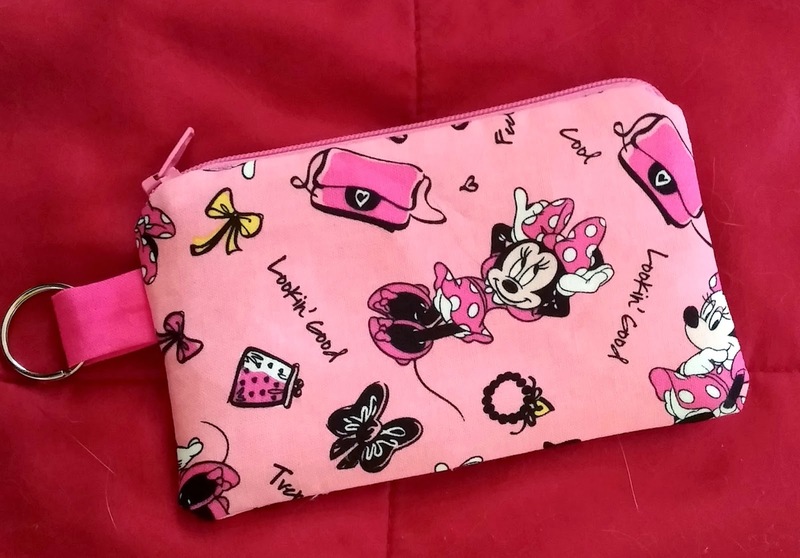 This pouch is my favorite, because the zipper construction allows for the pouch to 'open wide', you don't have to riffle through looking for something in particular because things are in plain sight better. I love that. It will still fit her stuff in it, since she doesn't wear any makeup. I added a small lotion and antibacterial gel to the pouch. I am really enjoying the improv, it's a great way to use up scraps! 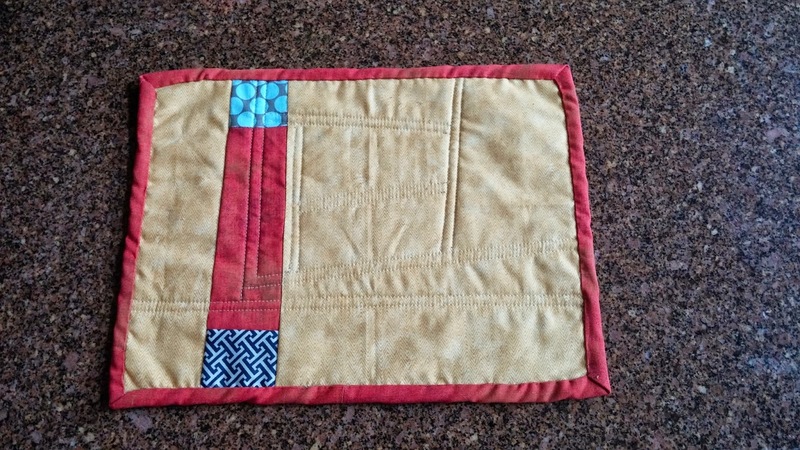 Here is the back of the mug rug - the strip of colors was cut off from the front when I squared it up and I had the yellow fabric in my stash, it happened to be the perfect size, serendipitous! I just did some straight line quilting on this one, I thought it would be just right for it! I am linking up to the following link parties: Think Pink Sundays; Threading Your Way; Show off Saturday: Show and Tell Saturday. 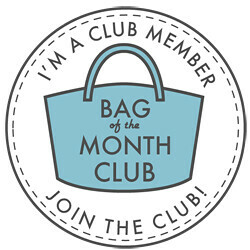 Bag of the Month Win - yea!! 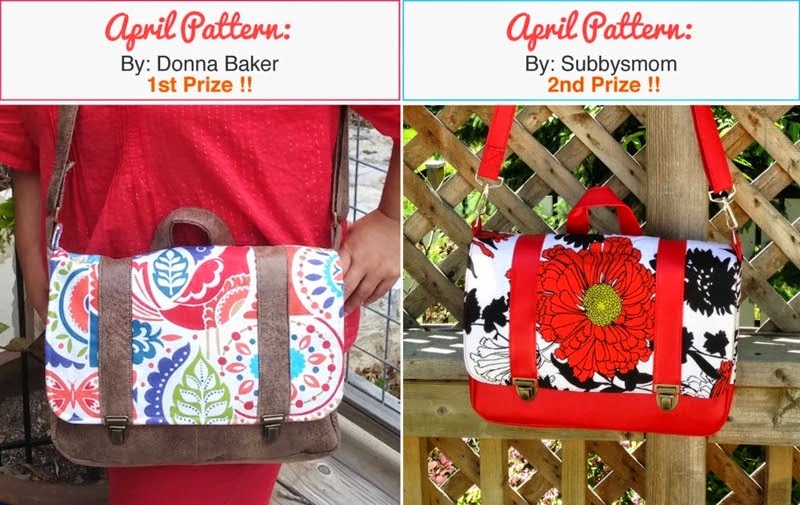 I just want to share some fun news - I was SO excited to get an email yesterday that MY messenger bag won first place prize out of all the fabulous entries in the Bag of the Month club - how incredible of an honor it is! 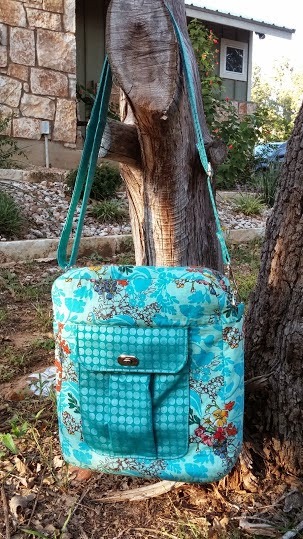 Janelle of Emmaline bags just made my day with this response: "Hi Donna! Well of course you did, your bag was gorgeous. 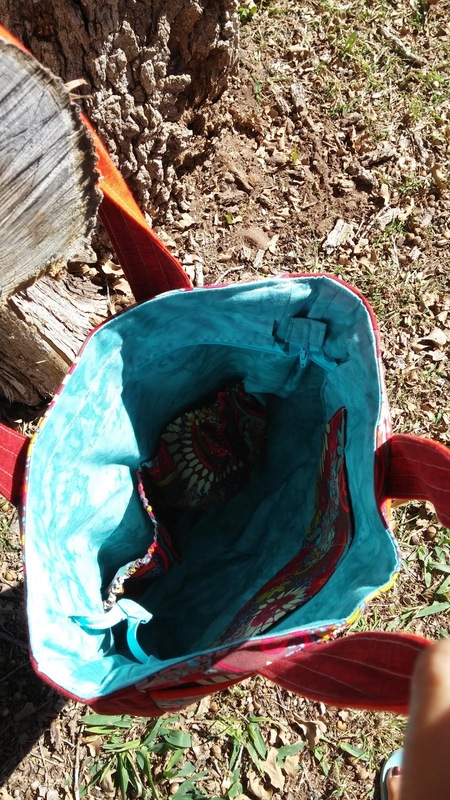 I loved your bag and I was so happy to see it selected as a 1st prize winner!" I'll have a post up with a creative finish by the end of the weekend. Thanks for stopping by! I am passionate about creating lovely things; I hope you find some inspiration in my creative journey!